your unaided eyes, unless looking through a known and tested solar filter intended for such use. The light from the Sun contains radiation energy across the whole electromagnetic spectrum. It generally radiates as a Black Body with energy peaking around 500 nm. Due to the absorptio reflection by the Earth’s atmosphere the energy levels vary across the whole spectrum. 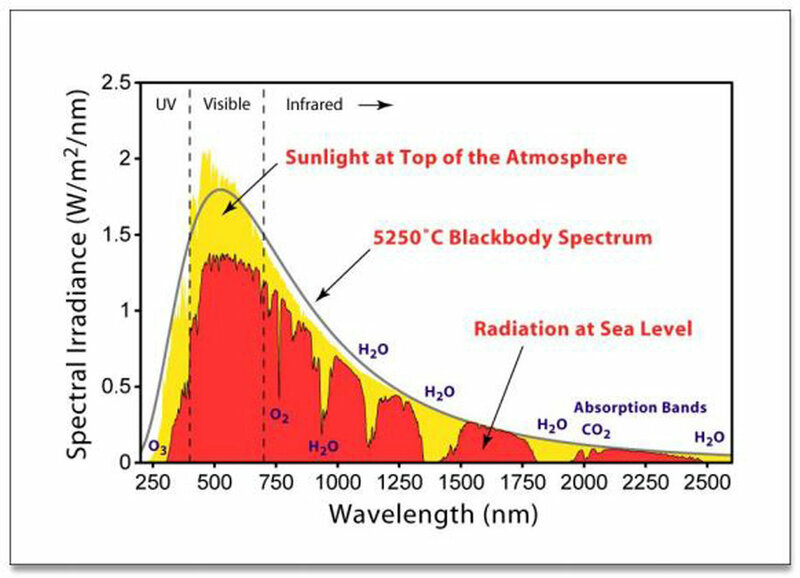 The human eye is sensitive to solar radiation from 380 nm to about 780 nm. The maximum daylight sensitivity (photopic vision) occurs at 555 nm (in the green part of the sun’s spectrum). As we age, our sensitivity to shorter wavelengths decreases, and in the adult population less than 1% of radiation below 340 nm and 2% of radiation between 340 and 360 nm reaches the retina. Energy in the UV-A, can cause damage to the eye (as well as the skin). Likewise IR-A radiation can cause thermal injury to the eye. Normal visible light, if bright enough, can cause partial loss of sensitivity and temporary blindness. Damage to the eye is more likely to occur due to exposure to UV-A, and bright visual light, rather than IR. There is a human “self-defence” reaction which generally makes involuntary eye movement when the eye is exposed to extremely bright light (eye movement, squinting, closing the eye) which reduces the effect of the energy, and gives some protection (Figure 1). adequate for solar projection. Do not use compound (catadioptric) telescopes (e.g. SchmidtCassegrain, Maksutov). A solar filter should transmit less than 0.003 % of visible light and no more than 0.5% of near-infrared radiation (Figure 2). Special solar glasses (Eclipse glasses) can be used when a large sunspot appear on the solar disk. Welder’s glass (#14) is also suitable for “naked-eye” observation of sunspots. Unsafe filters include exposed and developed colour film, exposed and developed black & white film, film negatives, smoked glass, sunglasses (single or multiple pairs), photographic density filters and polarizing filters, CDs and aluminized food wrappers. Solar eyepiece filters are also unsafe. aperture can be used for high-resolution work. improve the low contrast of white light solar features (e.g. Baader Solar Continuum, UV/IR, different Wratten filters). Narrow band H-alpha (656.3 nm) solar filters are mainly of two types: (i) front loading and (ii) end loading. The front loading filter uses a large diameter etalon (an optical filter that operates by the multiple-beam interference of light, reflected and transmitted by a pair of parallel flat reflecting plates, based on the Fabry-Perot Interferometer) over the entrance of the telescope. The end loading etalon is smaller and it's placed inside the light path of the telescope. Each of these configurations has advantages and disadvantages. The narrower a filter's bandpass or bandwidth (the extent or band of wavelengths transmitted by a filter) the greater is the contrast of the resulting image. In order to observe prominences in H-alpha a filter with a 10-angstroms (1 nm) bandpass is needed. A narrower bandpass filter will show a certain number of features but a sub-angstrom filter is needed to observe all the details on the chromosphere. The recent advent of CCD cameras that can be operated in a video mode, taking 10 or more images per second for periods of up to a few minutes, can be used with excellent results for high-resolution imaging of the Sun. Webcams and astronomical digital video cameras are equipped with a color or a black & white CCD or CMOS. These cameras operated with different interfaces (USB 1.0, UBS 2.0, USB 3.0, FireWire and GigE) capture several hundred to thousands of individual images (frames) in rapid succession storing them in popular video formats. This video file includes frames seriously degraded by seeing and others that are less affected. Specialized software align, sort and stack hundreds to thousands of images, automatically producing a low noise composite image. 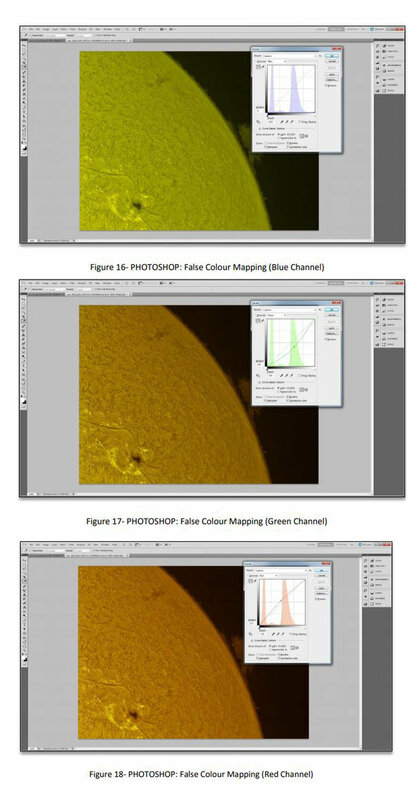 These images can be processed using aggressive image processing tools to bring out hidden detail (Figure 6). Amateur astronomers today regularly capture images of the Sun that rival those taken by professional astronomers. These images often constitute valuable scientific contributions. High-Resolution H-alpha imaging; (iv) Artificial flat-field.